If you were to walk into any major corporation, there is a fairly high chance that you will hear senior staff and management discussing Big Data; how it essentially highlights each piece of information that flows through an organisation’s channels and allows firms to identify inefficiencies and opportunities for improvement and growth. Given that professional sporting organisations are always looking at getting bigger, faster, stronger and smarter, the capabilities that Big Data can provide in regards to player improvement is immense. One of the better known examples that is used to convey the capabilities of big data in sport is through the 2011 film ‘Moneyball’. To cut a long story short, a data modelling method known as sabermetrics was leveraged to assess player capabilities purely based on their statistics and salaries, in order to determine the best possible line up. Although his method didn’t win the Oakland A’s a title, it did highlight the power of data and analytics within sport, and brought in new ideas and opportunities for improvement. Whilst Rugby League seems to always have a stat for everything, the nature of the sport makes it significantly difficult to provide these kinds of insights and is most likely the reason why we have yet to see something akin to this implemented in the NRL. As such, the purpose of this article and any subsequent discussions will be to provide unique insights into the statistics of Rugby League; leveraging big data capabilities to try and provide a more in-depth analysis, comparing players, teams and other related information. For my first look into the statistics of Rugby League, I wanted to determine how the half backs and five-eighths of the various teams faired against each other. To do this I obtained information relating to all players who wore a 6 or 7 during the 2017 season. It is worth noting that only data relating to the games in which players wore the number 6 or 7 has been included within this analysis. 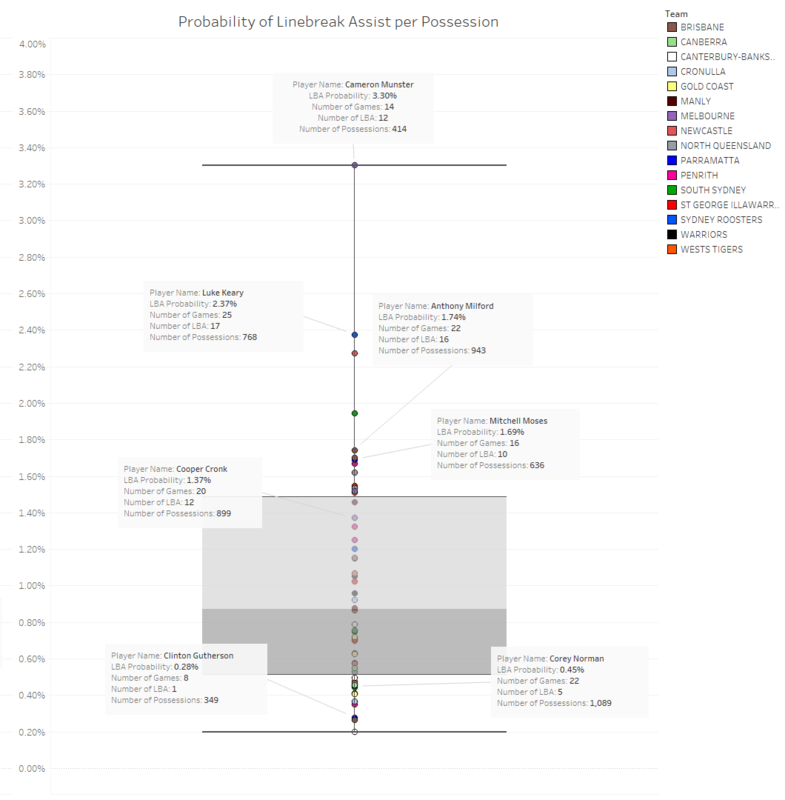 In addition, the data that is visualised below relates to the statistics of Linebreaks, Linebreak Assists, Number of Possessions and Number of Games. I decided I wanted to build a model that looked at the likelihood that each of these players would create a line-break for themselves or provide one to a team mate. Please refer to the chart below for the overall results as well as other key items of interest. This chart is known as a box-and-whisker plot and is used to categorise numerical data into quartiles for explanatory purposes. Each segment in the box plot represents 25% of the data set. In this case it is the halves within the NRL and they have been segmented into quartiles depending on their probability to provide a linebreak or linebreak assist. As such, the higher you are within this visualisation the better. 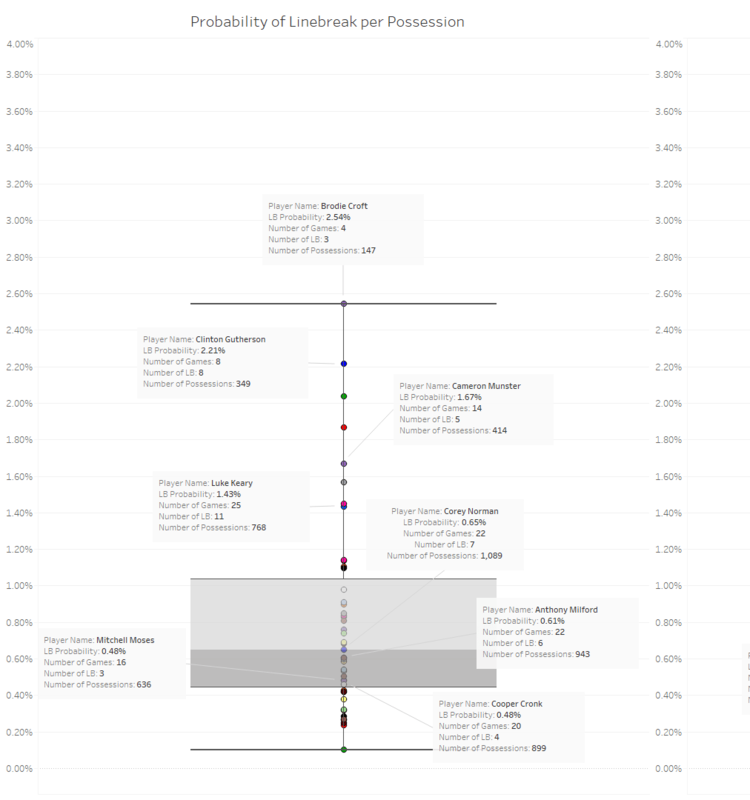 Essentially, this visualisation ranks each player against each other and more easily highlights who is performing above and beyond their peers. Or does it? On face value if you were looking at a halfback purely on the ability to create a line break, you would probably pick King Gutherson (2.21% Linebreak Probability) or Brodie Croft (2.54%) over someone like Anthony Milford (0.61%), Corey Norman (0.65%), Mitchell Moses (0.48%) or Cooper Cronk (0.48%). When taking into account the number of possessions overall and the style of how each of the respective teams play, you begin to realise that numbers in Rugby League are not always absolute. Whilst young Brodie Croft has the highest likelihood out of all halves to create a line-break opportunity, he is only taking possession at an average of 36 times per match, whereas halves like King Gutho (43), Cronk (45), Milford (43) are touching it significantly more. By nature, this implies that he, along with Keary (30 possessions per match), are not the ones necessarily doing the hard work with the ball or controlling the team around the park. By default, we know how strong Melbourne’s system is and that the likes of Smith, Slater, Munster and Cronk lay the platform for the rest of the team to do the damage. I would imagine the likes of Croft and Munster will fall back in these areas over the coming season, whilst Keary to remain flat as Cronk comes in to provide a similar role to that of Pearce. Surprisingly, on face value Corey Norman ranks quite low in both models. Over 2017, he averaged a whopping 50 possessions per match and probably was not as effective with the ball in hand in 2017 as he has been in the past. This is most likely due to the multiple halves partners he had before the arrival of The Prince of Egypt (Mitchell Moses). Judging by the numbers, and through review of the season gone by, Corey was, and is our army General, and through the structure that he provides, players like Gutho and Moses were able to be so effective with the ball in hand. Given that this was the case, concluding on his effectiveness as a half due to his low ranking in both models would be foolish. This same methodology is applied to Cooper Cronk and his partners, and most likely paints a more difficult future for the likes of Croft and Munster now that he is no longer with the Storm. When looking at the chart above, and keeping in mind the aforementioned information , it is not necessarily that concerning to see Corey so low on the list of his peers for line-break assists and highlights the fact that he brought a more calm and structured role to his game. The approach implemented by Corey and the coaching staff is further supported when looking at how effective Moses was with the ball in hand. He is rated in the top quartile of all halves for Linebreak Assists and this is purely down to the ground work that Norman provides. It is going to be fairly interesting to see how the likes of Munster perform over the course of the 2018 season given that he is probably the most effective out of all halves in both Linebreaks and Linebreak Assists. Given that he has to touch the ball significantly more often it will be interesting to see how he performs. I think the numbers don’t necessarily paint a bad picture for the likes of the Brisbane Broncos with the loss of Ben Hunt either. Milford has a significant number of possessions and is as effective as his top performing peers. If Corey can keep providing a similar structure, coupled with being more effective with his running game, I think the likes of Moses, Gutherson, French and our fringe runners are going to do some real damage over the coming season. One of the most exciting aspects that this analysis has identified is that Parramatta are essentially the only club other than Melbourn that are excelling in these areas with both halves. It is scary to think what Moses, and Norman can do with a full pre-season together. Stay tuned over the coming weeks for Part 2 where we will apply a similar approach for the centre position. We are in for a cracking year. Bring on the battle of the west on the 11th March! Would like to see the stats for the props for Parramatta compared with the other teams as I think this is our real weakness atm. If you look at their defensive stats you’ll see our middle forwards are not only not a weakness, but they are a strength of our team. My data is fairly granular for the past 7 or 8 seasons. I can look into this and see where they fall in respect of every teams pack and the great packs of the past decade. This is outstanding analysis from Dan, a seriously great first post. Yep, our opposition backs must be shaking in their boots. We certainly won’t be losing games because of a lack in creativity or options in our backline movements. If they focus too much on that, browny, Scott and Mau will hit them on the inside.